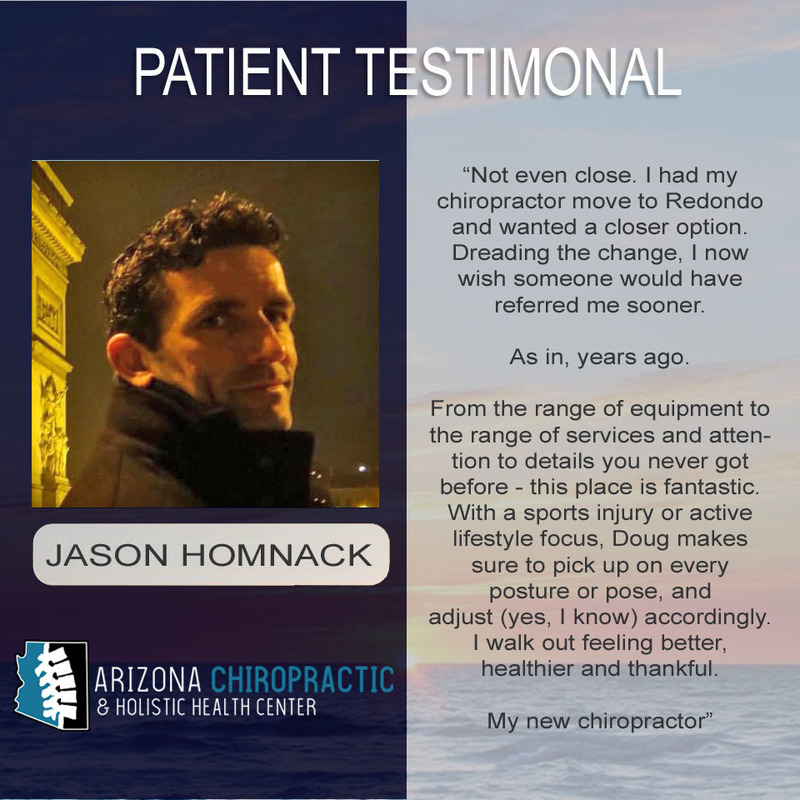 We value our patients' experience at Arizona Chiropractic & Holistic Health Center. If you are currently a patient, please feel free to complete the following Client Experience Questionnaire. The Questionnaire is in Adobe Acrobat format, and requires the free Acrobat Reader to view. I have suffered for several years with chronic and uncomfortable neck pain that, while not stopping me from doing many things, has been a constant source of trouble. I have tried acupuncture alone and while that has been helpful in treating my symptoms of crunchies and extreme stiffness on a temporary basis, I never knew what the real problem was or what else I could do to help myself. My husband and I are part-timers at Grayhawk and the second day back here this March, I was dropping off dry cleaning at the Grayhawk Plaza and saw the door was open to the AZ Chiropractic & Holistic Health Care Center. Just for the heck of it, I went in, met Dr. Doug and his wife and part-time office manager, Christina, and have been going back ever since! First of all, Dr. M has an X-ray machine in his office so I was easily, quickly, and rather inexpensively able to find out my problem: arthritis in the lower cervical vertebrates. Knowing this, Dr. M was able to provide me with a combination of services incorporating chiropractic, acupuncture (without needles), acupressure, and other hand and machine techniques that have really made a difference. One has to make a commitment to the treatment and I did – about 4-5 weeks of 2X/week. Dr. M also recommended a new pillow for me and I am really enjoying its benefits as well. Arthritis is a chronic problem and while I can never get rid of it, I have found that Dr. M’s combination of treatments and techniques has really proven helpful to me. I have recommended folks to him and will continue to do so. Dr. Morris and staff go above and beyond when assisting patient’s needs and concerns. As a patient, I am extremely impressed with the office and the overall professional core values it holds. Before every visit, I receive a phone call to confirm my schedule appointment. Upon arrival, I am always graciously greeted by the personnel. I love how the staff remembers my concerns and always follow up. Dr. Morris, never rushes the appointment, yet always takes his time to treat every distress and answers any questions necessary. I must say, this office is one of a kind, in regards to professionalism and patient care, therefore is a positive recommendation on my behalf! I would strongly recommend Dr Doug Morris for anyone experiencing pain in their neck and/or back. Dr Morris is the ultimate professional that utilizes mutliple treatment modalities to effectively reduce and eliminate pain suffered from trauma. I had a recent injury, and he used laser, adjustments, massage, heat, stretching, etc that has been effective in my treatment. I love this place and I have been telling everyone about it. The past Chiropractic centers I have been too just have you wait in a room and then when the doctor is ready, you get your adjustment. Here, you can get a massage (love these! Both of the girls that have given me massages were friendly and made me feel comfortable) and Dr. Doug is also very nice and professional. It’s a great place and has a very calming quality to it inside. You have to check it out! I recently recieved a therapeutic massage from a great therapist named Andrea. She really helped out my chronic right shoulder pain. She was very skilled in many modalities including hot rock, tai yoga and deeptissue. I could have stayed there forever, I was soooooooooooo relaxed and will definitly be back! You must stop in they are super friendly!!!! 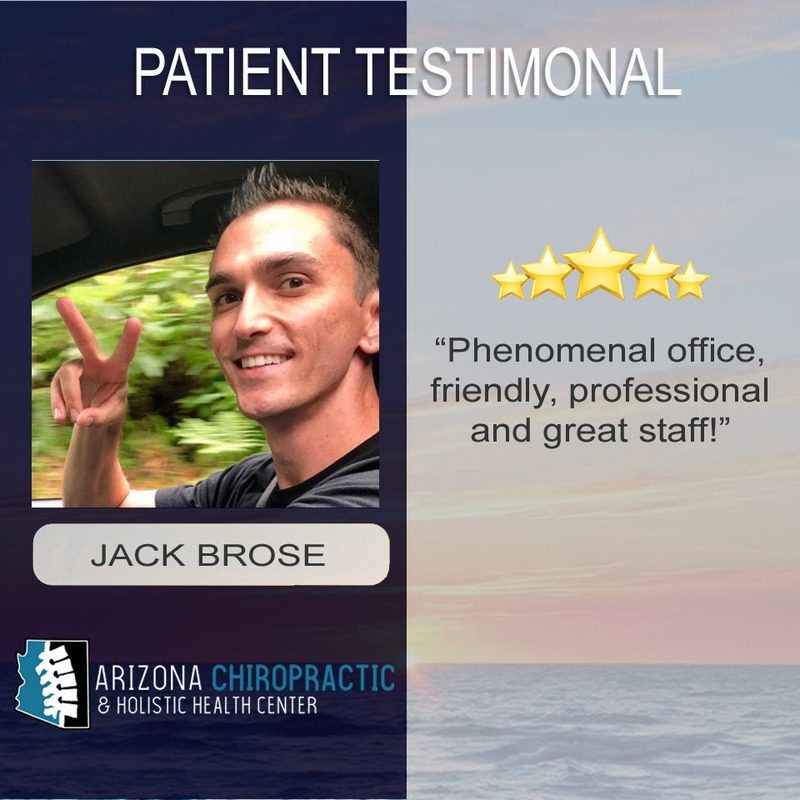 The Arizona Chiropractic and Holistic Health Center is a top of the line facility supported by a professional, friendly, and highly skilled staff. I have experienced few health care establishments that I would recommend so highly. I appreciate that Dr. Doug Morris and his staff are highly attuned to my personal needs as well as the amount of education they offer concerning my own personal situation, I did not feel like “just another patient”. The facility itself offers a stylish, welcoming and relaxing atmosphere. Needless to say I would highly recommend this practice and I plan to return for the amazing services they offer. Enjoy!! Dr. Doug is a caring and wonderful doctor. He pays attention to detail and constantly makes sure you, as the patient, understands everything and are comfortable. The office is equipped with state-of-the-art equipment that allows for complete care. The massage therapists are very well educated and knowledgeable. I personally recommend Dr. Doug and staff for any issues concerning the well-being of the bodily structure. I was recently in a car accident and my neck and mid back were killing me I could hardly move. I was referred to Dr. Doug and his staff through a friend (who has also had great experiences). My experience was so unique I felt very welcomed not like most Dr offices. They first started me on heat and traction which helped loosen me up a little then I went to get a massage and it made all the difference she was so wonderful and knowledgeable. I was still a little sore but oh my goodness then I went to get adjusted I didn't adjust very easy on the first time but the whole experience that day made me feel safe and taken cared of I can even explain how wonderful it was. I've been going their now for about a month now and I cant believe how far I have come and its all thanks to this office. Every time I go in their I leave better and better. I would recommend this place to anyone who has been in a car accident or anyone who wants to get great service and great therapies. Dr. Doug was recommended to me by a close friend of mine and I have been going to see him at least once or twice a month ever since. Chiropractic has been a part of my life since I was a child so it has always been important for me to find a chiropractor I love. Dr. M is unique to many other chiropractors because he offers a variety of treatments in addition to the adjustment itself. I love that I am there for over an hour every visit and I walk out of there feeling so relaxed and well taken care of! The combination of heat traction, massage therapy, percussion, meridian balancing, and the adjustment are amazing!! I feel very comfortable with Dr. M, as well as his staff, and I appreciate that he is open to feedback and new ideas. I would recommend to Dr. M to my friends and family and I have done so in the past. I visited Dr. M for the first time a few weeks ago. I have never been to a chiropractor before and was apprehensive to try it. I injured my lower back and had tried multiple methods in hopes of finding relief, but was not successful with traditional methods. As a classically trained dancer, I am extremely hard on my body and have felt constant mild discomfort for years. After only two visits to Dr. M, not only do I feel relief from my lower back injury, but I also feel an overall sense of well being. I would highly recommend Dr. M and his staff to anyone seeking a clean and comfortable environment with a professional and compassionate staff. I dropped in to Dr. M’s office when he first opened a year or so ago, looking for relief for some serious neck pain. I didn’t know what to expect, hadn’t visited a chiropractor for many years, and found acupuncture and massage were not enough. After about 3 weeks of 2-3 visits/week and a variety of different techniques used by Dr. M, I was feeling so much better and continue to do so with a 1/week maintenance schedule. I am only in AZ for 3-4 month a year but I schedule my appointments with him before I even get out here. A shout out to staff as well – Christina and Nicole! Clean, comfortable, and private. Would recommend (and have) to everyone. Dr. Doug should be the poster person for top of the line great care, effective relief and the minimum-ization of symptoms and ongoing rehabilatation. His caring and warmth are added benefits.My issues are complicated but fully understand and proceeded with an exact plan of treatment. I’ve been to them all, but this is the best!!! 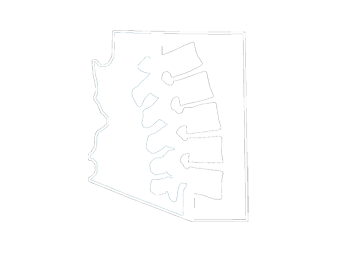 My neck and low back muscles felt thoroughly relaxed, and extremely loose after I recieved a 1 Hour Therpeutic Massage from Cassandra at AZ Chiropractoc and Holistic Health Center in North Scottsdale. My low back pain significantly decreased by the end of our first session!! Cassandra was able to stretch areas that I could not stretch on my own. She is excellent at targeting problem areas, and using the necessary pressure to help the muscles release. I highly recommend Cassandra for those with specific problem areas/injuries, particularly hip and low back pain- you will leave renewed and invigorated! 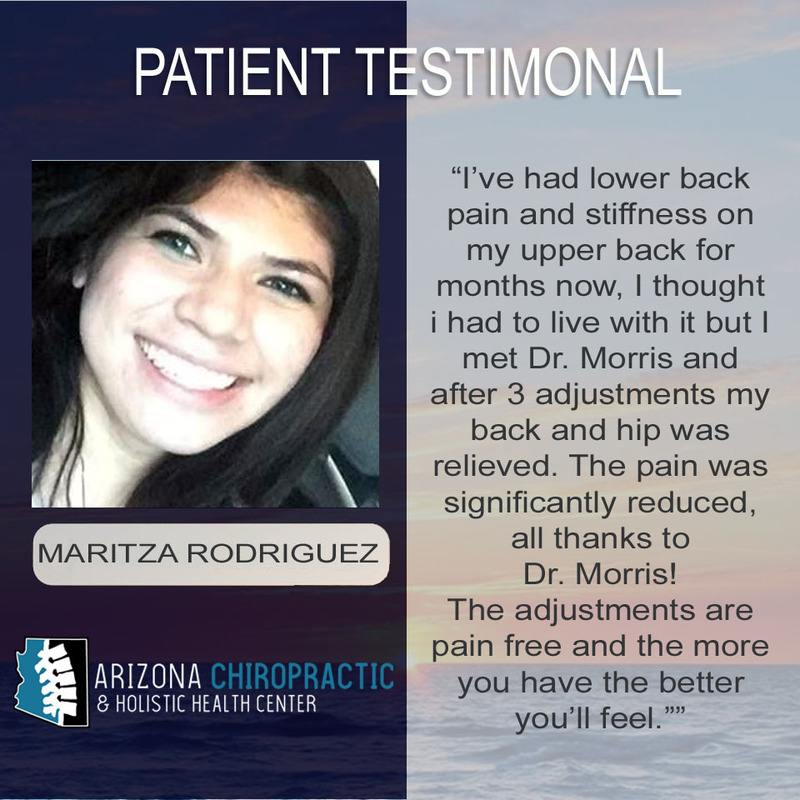 Dr Morris is an exceptional chiropractor. I went in for a visit 2 weeks ago. Having gone to so many chiropractors in my life, I know the difference when a chiro knows what he is doing and when he doesn’t. I have a scoliosis that throws everything off on me. He definitely understands the implications of what a scoliosis does to a person. After the adjustment, all the tissue work, and pressure points that he worked, I have less migraines, less aches now. I also noticed that I am sleeping a lot more at night, more than the usual 4 or 5 hours that I was doing before his work. I think that many of my aches and pains kept me up at night. I will be returning here because I am getting the help here. This doctor is fantastic! He gets it. The environment is very peaceful and healing. He uses all kinds of accessory tools to make the adjustments necessary, while his staff focuses on massages, heat treatment. You are picked up at the front door and assisted all along the way, through several steps each time. I had an auto accident (rear-ended at a red light) and Dr. Morris and his staff are helping me to heal! Dr. Morris insisted that I have a CAT scan when I came up with symptoms of headache and light sensitivity. While other doctors told me it was unnecessary, he insisted. I went to Thompson Peak ER and was diagnosed with a concussion immediately after completing a head and neck CAT scan. Three cheers and five starts to Dr. Doug Morris and his entire staff. They are true professionals. Just a quick shout out about this Chiro office. I purchased an on-line massage deal for a 75 minute to die for session. Had no idea it was a Chiro office. How lucky was I to find Dr. Morris right in my neighborhood. Came out of my massage and there he was. Began a conversation with him about adjustments and he really knows his stuff. So I had an adjustment right there and then……WOW who knew my headaches would go away and I mean right away. I have now become a regular for adjustments once a week and massages once a month. And have not had a headache since. Thank you Dr. Morris. The location is ideal right in Grayhawk plaza for those of us who live up north….great staff, clean environment, etc etc. 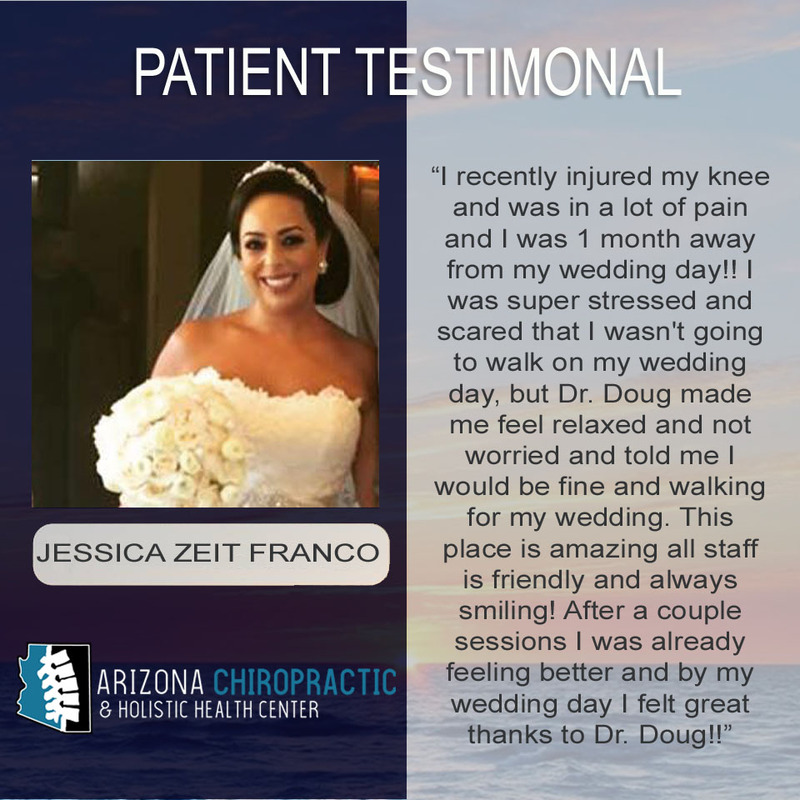 Thank you Arizona Chiropractic & Holistic Health Center!!!!! I had an online coupon to try this place out and it was well worth it. 75 mins of bodily feel-goodednes. My massage therapist started me on a sort of “warm up” by lying on a mechanical, heated massage table for about 10 minutes. after that, she took me to the massage room and asked if i would like to be stretched, which is rough for me, considering i have tendons, ligaments, and muscles akin to steel bands. After that, she pressed and kneaded and ground out alot of my aches and knots. this wasn’t a relaxing massage….more of therapeutic one. however, i did feel extremely awake, yet calm and clear afterwards. For the finishing touch, she had me lay face down and did a mechanical percussion to my back which actually felt pretty good. It was a great experience. the facility is clean, spacious and sort of contemporary, but the massage rooms are as cozy and soothing as they come. they also offer accupucture and chiropractic services which i didn’t have time to take part in. 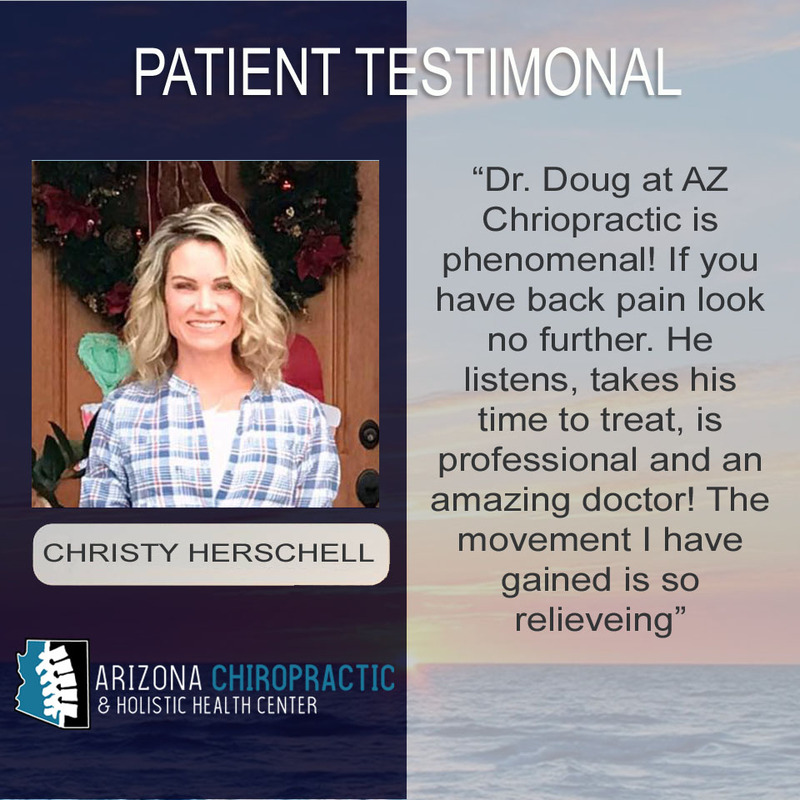 I started going to AZ Chiropractic because I had been getting horrible migraines for years and Dr Doug said I should come in for a massage and adjustment. 3 weekly visits later and my migraines started to subside. 6 months later it’s rare that I get headaches at all! Apparently they were migraines triggered by tension in my back and shoulders and his massage therapists work on my back and shoulders once a week and then Dr M adjusts me. If I miss a week I can definitely tell because my headaches come back. It’s great to be able to stop taking those powerful migraine medications and cure my headache through natural methods! They really are a great group and really do their best to make you feel comfortable and ensure that you are well taken care of! Best part, my insurance covers most of the services so make sure you ask Christina to check out your insurance coverage to save you some $$!! Therapist Mitch did an amazing job. He is very caring and passionate and a true asset to your company and the community. I will definitely return. Such a great massage! Relaxing but beneficial to my overall health! I will definitely be back! They had immediate availability, and my massage therapist, Mitch, was great! Nice staff, relaxing atmosphere and had a great deep tissue message. Mitch was great! Deep tissue massage was painfully awesome! Had a message with Donna, great job. One of the best. All the staff were very nice and responsive. Very thorough and enjoyable massage! Awesome experience. Exceeds my expectations. Loved heated rolling table (about 10 min.) before massage. The massage here is excellent. That is coming from someone who has received massages for over 20 years. Very nice staff. Dawnyelle's massage was amazing; she listened well, was very nurturing, and really helped significantly with a pain in my hip that has been giving me a lot of trouble. She knows what she is doing - I highly recommend her! Excellent massage! I returned a second time and made a third appointment! It was one of the best massages I have ever had. The massage therapist Donna was fabulous! The office was comfortable and inviting, and the people friendly and conscientious. I have already recommended them to friends who live in the Valley, and I'll go back again. Great overall experience! Thanks a lot!!! Great massage. Just the right touch. Friendly. Treated like a valued customer. Wasn't pushy about return business and very relaxing. Did a great job and very friendly. May go back if prices are low. Best massage! My therapist focused exactly on the areas where I was feeling pain or stress. Will definitely go back! Massage was great. Would go back. Friendly staff and an excellent massage from my therapist! Very good massages. We will probably go back the next time we are in Phoenix. They were very friendly when I arrived the office was neat and clean. My massage was good. I didn't know about the place until I got the groupon, but glad I went there because the service and massage was excellent! I had a wonderful massage by my therapist. She made me feel very comfortable and I was so relaxed afterwards! Massage was phenominal! Was not pressured to start any treatments what so ever. My massage therapist, Donna, was wonderful! Best massage ever! Very nice folks and received a great massage. Feel great afterwards. I enjoyed my massage very much. It really helped my injured leg. A great value. I'll be back. Pleasant atmosphere and good massage. Great experience and I hope to go back sooner than later!! 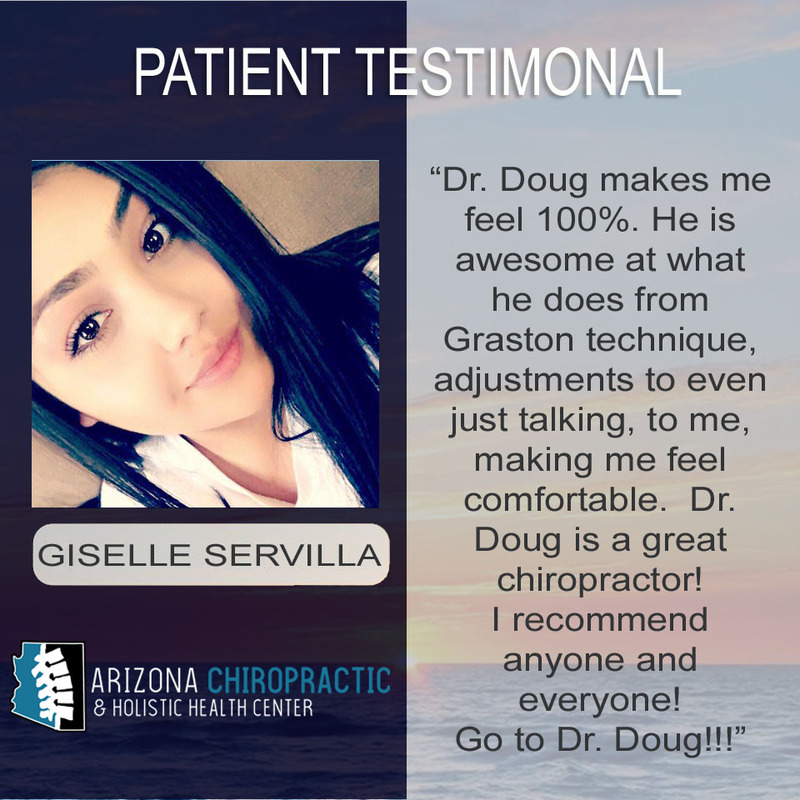 I had a great experience at AZ Chiropractic and I will be back for another massage and adjustment. Was given this Groupon as a Christmas gift . They offer massage and I got a very good one . My wife loves massages, and has had many. She told me that this was one of the best massages she has ever received!! The massage therapist at this center, is fantastic. the best massage I have had in a long while. First became aware of this business through Groupon. Thanks! Everyone was very friendly and helpful. They did a very good job. The young lady that gave me my massage for 90 minutes was wonderful and she took her time and did a very deep heated treatment and it felt wonderful! Donna did a great job. I hope to have the chance to go back altho it is a further drive from my house than I had thought it was. Was great experience. Would recommend! Most therapeutic massage that I've ever received. Outstanding! Very nice staff. Great masseuse. The Groupon was great and this was my first massage. It was fantastic. I bought this for my mom and she loved it very much, thank you~!! !